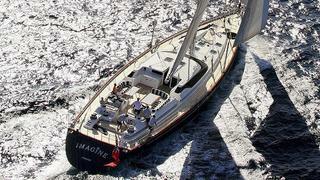 A call to Fraser Yachts in Palma confirms that Thorsten Giesbert has taken over the listing of the 33.62m sailing yacht Imagine B jointly with Toby Walker at Dubois Yachts. ABS classed, Imagine B was built in 1993 at the Alloy Yachts yard in New Zealand and refitted in 2008. She was designed by Ed Dubois, and features an Agnes Comar interior. She can sleep up to seven guests in one master, one double and one twin cabin, along with one Pullman berth. A 570hp Lugger diesel engine offers a maximum speed of 12 knots and a cruising speed of 11 knots. On display by Fraser at the upcoming Palma Brokerage Show, Imagine B is asking €4.8 million, VAT paid.